Generally, protein quantitation can be made using a simple UV-Visible spectrophotometer. The V-630 Bio (Figure 1) is a UV-Visible spectrophotometer designed for biochemical analysis. The V-630 Bio includes 6 quantitative methods based on UV absorption spectrophotometry including the Lowry, Biuret, BCA, Bradford, and WST methods. Table 1 (below) shows the features of the six different quantitation methods. As outlined, a method can be selected by reviewing the sample and quantitation range and the presence of possible contaminants. Five of the analysis methods use a chromogenic reaction. Reagent manufacturers produce chromogenic kits for BCA, Bradford or WST with a protocol explaining the relevant measurement procedures *1). Chromogenic reagents for the Lowry and Biuret methods must be prepared by the user. The measurement procedures for the Lowry and Biuret methods differ according to use. For that reason, this application note explains how to create the calibration curves for the Lowry, Biuret and UV absorption analysis methods. Fluctuations in the values depending on the type of proteins and the differences in the concentration ranges calculated as a result of the cell volume *2) were also investigated. UV Abs The absorption maximum at 280 nm corresponds to the response of the tyrosine and tryptophan and is used for the analysis method. 50 to 2000µg/mL (*BSA) Simple method. Sample can be used after measurement. The absorbance differs for each protein. Proteins such as collagen and gelatin that do not have absorption at 280 nm cannot be measured. Contamination by nucleic acids with absorption in the UV region obscures the measurement. Biuret Protein solutions turn purple after the polypeptide chain chelates with a copper ion. An alkaline solution of Biuret reagent including copper sulfate and Rochelle salt is added to a protein solution. Uses the absorption maximum at 540 nm to determine the quantity. 150 to 9000µg/mL (BSA) Simple procedure. The chromogenic rate is constant for most proteins. Low sensitivity. Sample with a low protein concentration cannot be measured. The chromogenic reaction is influenced by high-concentrations of trisaminomethane, amino acids, and ammonium ion. Lowry Add an alkaline copper solution to a protein solution. Tyrosine, tryptophan, and cisteine of proteins reduce molybdenum acid and phosphotungstic acid of a phenol reagent, turning the solution blue. Uses the absorption maximum at 750 nm to determine the quantity. 5 to 200ug/µL (BSA) High sensitivity. Widely used. Complicated procedure with a long preparation. Since the chromogenic reaction occurs by a reduction reaction, contamination of the reduction material interferes with the quantitative determination. The chromogenic rate differs for each protein. BCA The BCA method combines the Biuret method and Bicinchoninic Acid (BCA). BCA has high sensitivity and selectivity for copper ions. When a copper ion that is formed by the reduction action of protein reacts with 2 molecules of the BCA, the solution turns purple. Uses the absorption maximum at 560 nm to determine the quantity. 20 to 2000ug/µL (BSA) Simple procedure. High sensitivity with wide concentration range. Thiol, phospholipid, and ammonium sulfate interferes with the measurement. Bradford The absorption maximum of a protein shifts from 465 nm to 600 nm when the protein binds to the Coomassie Brilliant Blue G250, one of triphenylmethanse blue pigment. Uses the absorption maximum at 600 nm to determine the quantity. 10 to 2000g/µL (BSA) Very simple operation. Hardly influenced by the blocking materials. The chromogenic rate differs for each protein. Contamination by a surfactant can interfere with the chromogenic reaction. WST Reduce WST-8 with proteins with a high pH, turning the sample blue. Uses the absorption maximum at 650 nm to determine the quantity. 50 to 5000µg/mL (BSA) Simple method. Hardly affected by a surfactant. The chromogenic rate differs for each protein. Figure 4 illustrates the absorption spectrum of Human Serum Albumin (HSA). Simple UV Absorption spectrophotometry can determine the quantity of proteins in the sample by using the maximum absorption at 280 nm. Bracketed values are for concentrations used with a 10 mm rectangular cell. The other values are concentrations used with a 10 mm rectangular cell and micro cell. Measure the absorbance of the protein solution at 280 nm. Protein solutions turn purple with an absorption maximum of 540 nm when Biuret reagent is added (Figure 5). The time course of the chromogenic reaction was measured at 540 nm absorption. The absorbance became stable approximately after 60 minutes (Figure 6). Figure 7 shows the spectra of the HSA aqueous solutions that were measured after 60 minutes. The Biuret method determines the quantity by using the absorption maximum at 540 nm after reacting with the sample for 60 minutes. Add Biuret reagent (2.0 mg) to 500 µL of protein aqueous solution and mix them well. Then react the solution for 60 minutes. Measure the absorbance at the wavelength of 540 nm. Protein solutions turn blue with an absorption maximum of 750 nm when Alkline copper solution and Phenol reagent are added to a protein solution (Figure 8). The time course of the chromogenic reaction was measured at 750 nm absorption. The absorbance became stable after approx. 60 minutes (Figure 9). 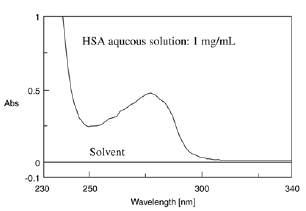 Figure 10 shows the spectra of the HSA aqueous solutions that were measured after 60 minutes. The Lowry method determines the quantity by using the absorption maximum of 750 nm after reaction of the sample for 60 minutes. Alkaline copper solution: Mix 50 mL of 2% Na2CO3 solution *3) with 1 mL of 0.5% CuSO4 solution*4) (can only be used for immediate analysis). 0.5% CuSO4 solution: dissolve copper (II) sulfate pentahydrate (50 mg) and potassium sodium tartrate tetrahydrate (0.1 g) in 10mL of water. Phenol reagent: Dilute commercial solution (2N phenol chemical reagent of Kanto Chemical) to 1N. Same concentrations are used both for the 10 mm rectangular cell and the micro cell of 10 mm. Add 2.5 mg of alkaline copper solution to 500 µL of protein solution. Allow to react for 10 minutes after mixing well. Then, add phenol reagent. Rapidly mix and allow the solution to react for 60 minutes. Measure the absorbance at 750 nm.